Today was our 32-week ultrasound with the perinatology unit at the hospital. She’s been wiggling and moving and hiccuping and kicking/punching me lots (keeping me up at night … good prep for mommy-hood, no?) and it was cool to see how she’s positioned — head down, lying comfortably on her side with her spine on my left side, which explains why most of the movement I’ve been feeling is on my right side. She kept her face down throughout most of the scan (boo! ), where the tech checked her measurements and organs and everything and it all looked normal and good and healthy — whew! But she’s measuring on the small side. As in, 17th percentile small. So he asked how big my husband and I were at birth/how my mom carried, as that usually is a good predictor as to how a mother will carry/size of her babies. Well, I was two weeks late and only 6 lbs 10 oz and as I’ve noted before, my mom carried low and small. My husband was 7 lbs. So neither of us were huge which means we probably wouldn’t make a huge baby. And we’re having a girl, and girls tend to be smaller than boys. Anyway, in spite of knowing how genetics can come into play … you can imagine how much of a failure I felt like upon hearing this, as I am her sole source of nutrition and I’ve already been concerned I’m not “big enough” to be as far along as I am. So I asked if there’s anything I could do (or should have done) to make her bigger …like eat more, etc. He said absolutely not; that it’s nothing I did or can do. Some babies are just smaller, and that’s a fact. She will take what she needs and genetically, she’s probably just on the smaller side — nothing I can do to change that, though obviously we want her to continue to get bigger. The plan is for us to go back in four weeks for another ultrasound to check on her growth and see if she’s getting bigger. He said he’d be more concerned if, say, her head circumference was measuring much bigger than, say, her abdomen … but she’s proportionally small … and otherwise healthy. This happens in 20-40% of babies (statistics vary) and my doctor says this should NOT be a cause of concern to us especially since they know it now … but it was still scary to hear. He also recommended once a week (or twice a week, depending on what my OB says) non stress tests just to be sure everything is OK with her heartbeat and if things look bad, they’ll induce me early but hopefully that won’t be the case. I posted on BabyCenter.com about this cord situation and got tons of reassuring comments by moms who had this happen — I guess it’s fairly common but most people don’t know before delivery that it’s a problem; this ultrasound showed us what was going on, or we wouldn’t have known, either, until delivery. So if there’s a silver lining, it’s that we know a little more of what to expect. To be honest, all the extra testing we’ve gone through has been a double-edged sword. Sometimes I wonder if ignorance would be bliss … all this information sometimes just feels overwhelming and scary and riddles me with anxiety (hubby however remains cool, calm and collected–telling me he heard the exact same things as I did but isn’t concerned and has faith she’s just fine!) … but then I love the extra testing we’ve gotten because it’s given us an eagle’s eye perspective into the ins and outs of her development … and when we look back at the first ultrasound at 10 weeks, where she literally looked like two connected blobs … to an actual baby with a face that isn’t reminiscent of Skeletor 😉 … it’s mind-blowing. I really feel like this entire pregnancy has been a test of my faith. A test of patience. Sometimes I feel like I’m passing … and other days, like today, it’s hard to feel so optimistic … yet I know that there’s no other way to look at this situation except glass half-full. She’s going to be OK … and I just need to start believing it. Truly believing it. After all … hope floats! Aw! Hang in there! She sure is a cutie-pie! I will say a little prayer for her right now that everything will continue to progress well! Thank you! It was hard to make out her features but hopefully next time she’ll let us do it with 4D! Having faith is the one thing you know you can do. The whole pregnancy with complications thing is SO hard. 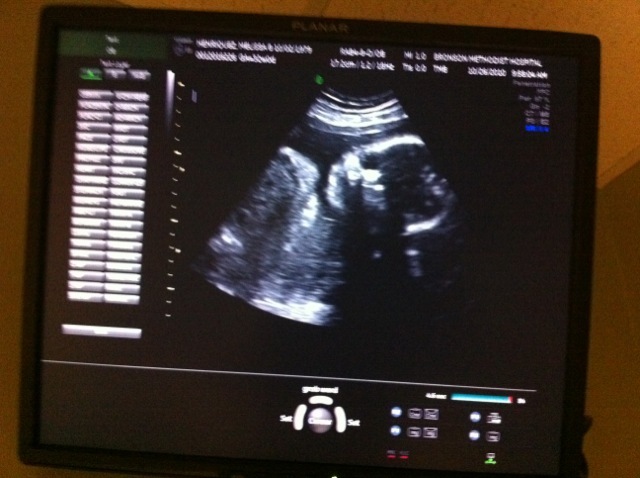 I had a zillion sonograms and I only ever felt 100% okay when I was in the moment, looking at him on the screen. The second we left, I would be like, “Gah, what if they missed something?” My husband was calm, too, while I was always so nervous – I think it’s just the mom’s role to be nervous. After all, you’re responsible for growing this person – even though a lot of their growth is out of your hands. The babies put on a bulk of weight in the last four weeks so she’ll grow just fine. *Someone* has to be in the 17th percentile. That’s the whole point of percentiles! Not everyone can be 50% or 85%. So true, Candice–it’s all we have right?! I def. think you’re right; it’s a woman thing to be so concerned. I think that is going to be what happens–she’ll gain a lot in the next few weeks and even out; that’s the hope!!! Good to know that about your hubs, too! I am so sorry you’re having such a stressful pregnancy. But I honestly think that Maya will be just fine. Both issues that came up today are not out of the ordinary and like your friend said, you wouldn’t even have known about them if not for the late-pregnancy ultrasound. Trust me, if the doctors were worried about it either one of those things, they’d let you know! I had spotting throughout my pregnancy from 19 weeks on, and even though they told me “one in four pregnancies has unexplained bleeding!” it was little comfort. But everyone told me L would be just fine and you know what, they were right! The NST every week should alleviate some of your worries and as long as she’s moving and kicking a few times an hour, you know she’s fine! As I’ve told you via email, my son had developmental delays during his first year, and I spent months and months sick with worry. He’s basically caught up now, and although there are still some concerns, I feel a whole lot better about his future :). But I do know how horrible the worrying is and how hard it can be to just relax. If you ever need to chat, please drop me a line! Aw thanks Alison!! :)LOL, wine would be nice…! glad you love her name, too 🙂 I know you’re right, it’s just hard not to be preoccupied when we hear stuff like this. So glad to know how well L is doing–that is definitely awesome!! 🙂 And thank you–I appreciate it! She’s nearly 18 now and is 4’10” and 90 lbs. She is perfect in every way (got her period at 13, etc) but just a more tiny version. She loves it! Unfortunately finding clothes must be done in the girls section (a 00 is too big) and shoes for a size 3.5/4 are hard to find for a teenager that wants more adult looking heels, haha. And if you ever want to talk about this with someone who’s been through something similar, I’m always here.